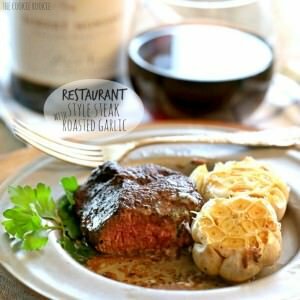 This Restaurant Style Steak with Roasted Garlic and Cilantro Butter is so easy to make at home and is SO delicious. Valentine's Day isn't complete without restaurant style steak! You can do this! 2 8 ounce filet mignons worth the splurge! Mix 1/2 stick softened butter with the garlic and cilantro. Roll into a log on plastic wrap and refrigerate. Heat the remaining 1/2 stick of butter and the olive oil in a skillet (cast iron works best but isn't required) to a screaming hot temperature. Sear the filets in a screaming hot pan for about 2-3 minutes per side, or until a nice brown crust has formed. Once both sides are seared, transfer the steaks to a baking sheet and cook for 6-8 minutes in the center of your oven. Your steak will be medium rare when it is approximately 135 degrees in the center, or when you push lightly on the top center of the steak and it gently and slowly bounces back. I think this is the BEST way to eat your steak. You get the most flavor if it isn't over cooked. If you prefer a more well-done steak, you can cook a few minutes longer. Place a slice of cilantro butter on top of your steak prior to serving, while it's still hot. The butter will melt and make the steak extra delicious!